There is an old saw in the Porsche, and European auto as a whole, enthusiast circles that the most expensive Porsche/Ferrari/Lotus you can buy is a cheap one. The problem is, no one talks about the fact that this is only true if your goal is to own a perfectly restored, 100% stock Porsche. There are many reasons why a car can be inexpensive when benchmarked against a show car example. And not all of them bad. That is the goal of this guest post, to convince some of you that an inexpensive Porsche can be a great purchase. For those of you whose first Porsche was a shiny new one. Or a recent model that was Porsche Approved, then you do not know the joy of stretching to reach the marque. And in that stretching, only able to get a pinky finger on the lowest rung. When I bought my first Porsche, a 1967 912, I was just six months into my first salaried job as a copywriter. Hmmm. With regular money coming in, I could make a regular payment. This was how I got a short wheel base gem sight unseen from California and shipped to me in Connecticut. My wife and I went to collect it from a truck stop. It stalled. It was more dented than the pictures showed. Damn you white for hiding so many imperfections! I loved it. I loved it when a brake caliper seized on my commute to Darien and shot me off towards the curb. 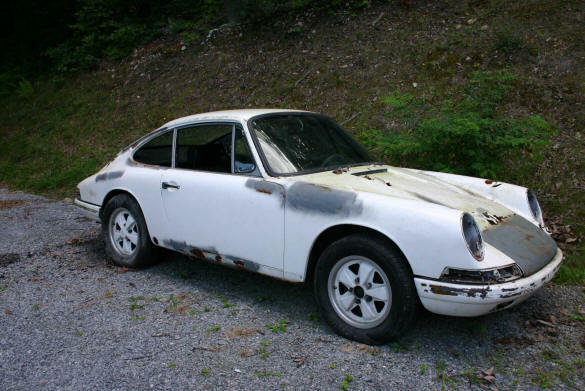 I loved it when I went rummaging through a fire damaged 912 in a junkyard for some better interior trim bits. I loved when I went driving with a stripped out interior because I had no funds to replace what I removed. I loved working on it. I loved putting wrenches right on the paint. You see, it was not perfect for concourse, but it was perfect for me. It was a Porsche but not a showpiece. It said to me, go ahead and learn to work on these cars. Set a beer on me. But overall, it said to me engage with me, I always need something to fiddle with. But with a change in career and a move to Denver I had to sell the car. A few years Porscheless, a few more dollars in the bank. More responsibilities at work and the restoration of a house had me strapped for time. And with the money available I no longer needed to buy the cheap Porsche. I could buy one that was done. Perfect. Pristine. And I did, I went through 3 concourse 951s and picked up a ludicrously nice 1983 911SC original down to the radio and Monroney sticker. Like an Australian Shiraz, these cars perked you up right away but lacked depth. Except the SC. But that is more like a Grange you're waiting to uncork at the right time. So, all the 951s have been sold and replaced by a 1997 Boxster that I drive all the time. In all weather. It had a panel repainted and is only a 2.5L but it puts a smile on my face. A worry free smile. I replaced the brakes and rotors. I modified the heating flapper. I work on it without thinking if this is correct and proper. Only, is this going to make the car more enjoyable to me. And I was having so much fun with this Boxster. I thought, why not pick up another Porsche? This time for only a few hundred dollars and a snowboard in trade. It is a 1983 944 with dodgy paint and solid mechanicals. I am turning it into a track car. I bundle up to go work on this car outside, in winter, in the driveway. It calls to me like my 912 did to engage with it. Fiddle with. Heck, I like just driving around the block in it listening to the gravel ping off the floor and reverberate around the stripped, soon-to-be-race-ready, interior. I make stuff to fix this car. I invite friends over to share in the fun. The creation. Maybe a cheap Porsche is not everyone's idea of fun. But you need to try it before you despise it. You need to build a relationship with a car. It seems the less I spend on a Porsche, the more I enjoy it. Today's post was written by Kevin Gosselin, author Hunt for 901 and Porsche Fanatic. I am now 50. I have owned 7 Porsche cars. ’71 914, ’69 912, ’78 924, ’84 911, ’81 911, ’01 Boxster, ’04 Boxster S. I got the 914 when I was 19 years old. I worked on it every chance I had and rebuilt everything only to have it T-boned by a drunk driver the first 20 minutes I took it out after 2 years of working on it. I still have the ’81 911sc wide body Euro-spec (very rare and saved from Hurricane Andrew – insurance auction deal – still restoring and driving it) and a pristine ’04 Boxster S. My wife still can’t understand why I like the “old” car with no power anything better than the new one. The 944 is a great track car. I’ve seen them race Corvettes and win. The Porsche 944 has near 50/50 weight balance and will go around a ‘vette in any corner, until the ‘vette out muscles the 944 in the straight…until the next corner! I really enjoyed reading your post. If you ever get a chance, get the book “The Gold Plated Porsche” great reading. It’s nice to know there are lots of Porsche folks out there that don’t become “Porsche fans” by having lots of money. I have no respect for guys that go to the dealer and just buy a new Porsche and suddenly think they’re cool. Nice post Kevin. I currently own a 92 964 Cabriolet, Amazon Green, Beige interior, 5 speed. Had newer ones but they seem to drive themselves. No fun. I have to drive this one and I love it. I’m now looking for a beater, you know, something “wrenchable.” Have fun !